Travelling in the back of a taxi to work in one of the three major hospitals in busy Yangon, that Open Heart International offers its’s services to, can be a rather dizzy affair. So I’ve included a rough map of Yangon for some ‘place’ orientation. 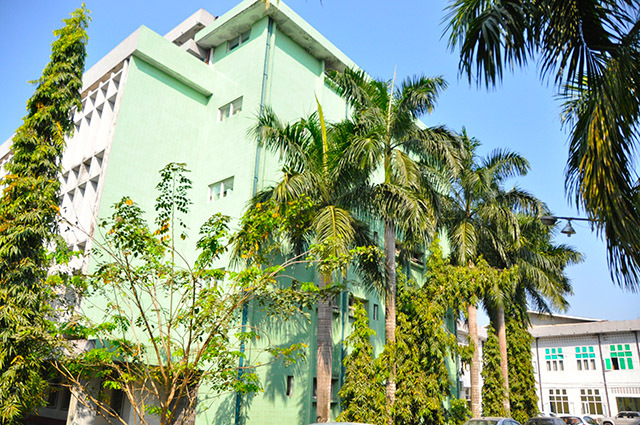 We are staying at the Traders Hotel, which is situated between the Yangon River and the Yangon General Hospital. 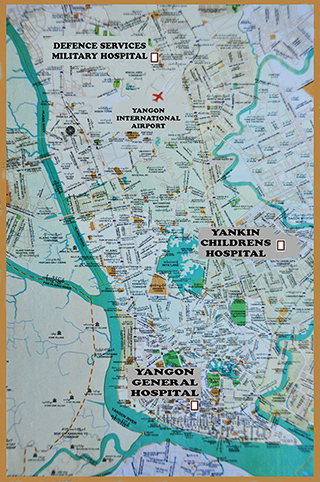 Actually, its a pleasant 20 minute walk to the Yangon General Hospital from the hotel, but quite a drive to the Yangon Military hospital. Perhaps 45 minutes. A Burmese surgeon was joking with me recently, “We had horse and cart here in the 19th century. We’ve now swapped them for motor vehicles, but the velocity, and time of travel have not changed! Ha Ha”. Often many of us need to be visiting two or more of these hospitals in a day, to efficiently spread the health services we offer and move equipment around. If you miss the taxi that has been organised and on offer, then you could be in for a wait. Hence, most of us are opportunists and don’t miss. 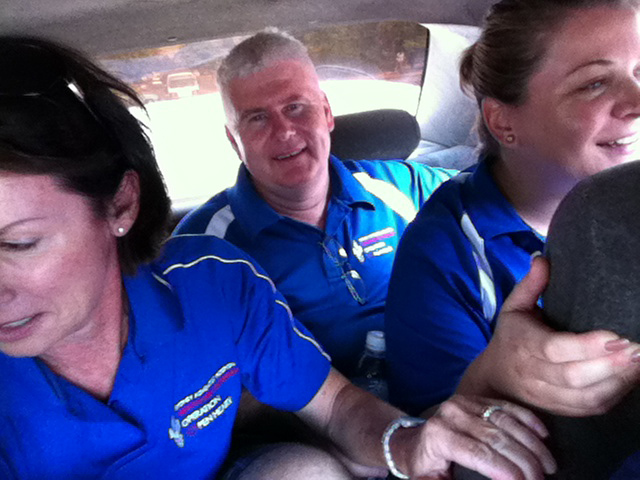 Below is a pic of part of the group in the back seat of a taxi sedan. Chris Waite and a uniformed army lieutenant were more or less right at the back, with Chris Darwell and Catia Da Costa-Wooller on laps. Yes that’s right, four in the back, with the driver and ‘yours truly’ in the front. Chris Waite our Open Heart International Coordinator should get a plug before showing you the next pic (taken not long after the previous pic). This guy is amazing! He is the first up in the morning and often the last to sleep. Usually on the phone and emailing. Always busy trying to keep us all organised and happy, Chris presents relaxed, no matter how chaotic things get. 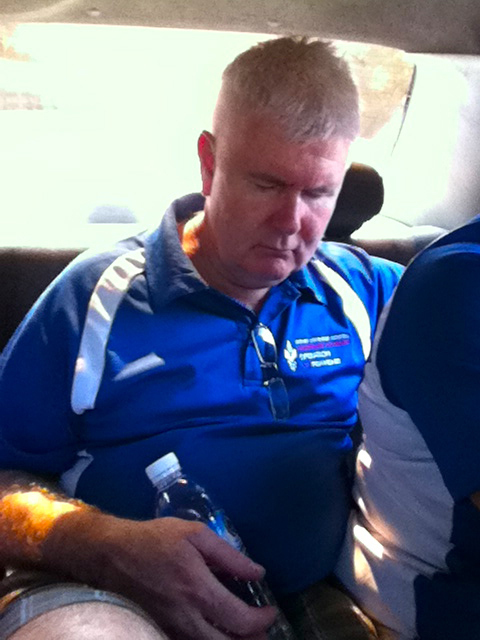 He has actually perfected the art of micro sleep, anytime and anywhere. Entering the Yangon Military Hospital can require saying hi to the guards at the gate. 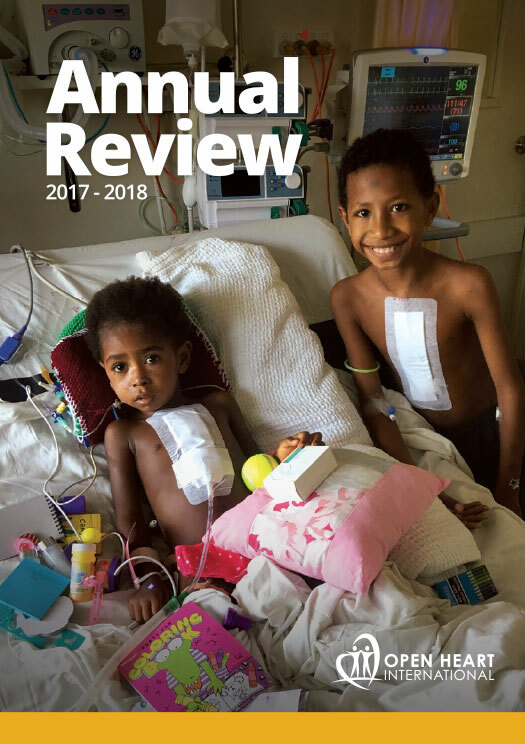 While the Yankin Childrens Hospital is a 300 bed hospital with two theatres, the Military Hospital has a 1000 bed capacity with 9 operating theatres plus two cardiac operating theatres. 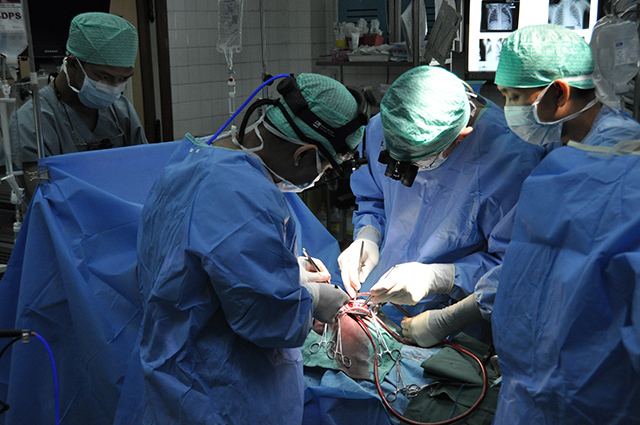 A major theme of Open Heart Internationals 2013 Yangon visit, has been to help introduce paediatric cardiac surgery to the Military Hospital, which is primarily an Adult hospital, and adult cardiac surgery to the Childrens Hospital, which is primarily a paediatric hospital. Pic below; part of the Military Hospital buildings. Prominent congenital Atrial and Ventrcular Septal Defects (ASD and VSD), is 60 to 70% greater in Myanmar than the international average. It has also a greater mortality rate. In layman’s terms, it is a disease of being born with a hole in the major middle wall of the heart. 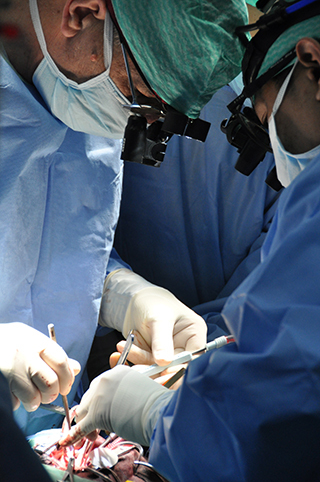 For a healthy and normal life, this requires cardiac surgery to close the hole. The remote areas of Myanmar need more paediatric support than adult. The pics below show Paediatric Surgeon Dr. Graham Nunn performing cardiac surgery at the Military Hospital.